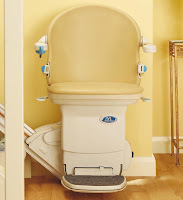 Castle Castle Comfort Stairlifts offers top brand stairlifts, keen prices and fast installs for all those seeking stairlifts in Corby, Northamptonshire. And all work comes with our no-quibble guarantees and famous customer service satisfaction. Give us a call today on 01604 269919 If however, you are looking for fascinating facts about the area then feel free to read on. Corby in Northamptonshire has the fastest growing population not just in Northamptonshire but in England! Is it something in the water? Most of the mix of retired residents in Corby still have a spring in their step; when they do find that the spring has sprung and getting up and down those stairs is a problem, Castle Comfort Stair Lifts step in! We’ve been supplying and installing the people of Corby with their stairlifts for almost 15 years. We are agents for all UK stairlift manufacturers so can offer an unbiased recommendation depending on your needs and your staircase. If you need to join the 250 retired people in Corby who already own stairlifts, then please give us a call on 01604 269919 . Corby’s development as a new town was led by architect William Holford back in the 1950’s. He had been heavily involved in town planning following World War II and instrumental in the draft of the Town and Country Planning Act of 1947. By the middle of the 1950’s the influx of new residents to Corby came mainly from Glasgow, Scotland. This has been reflected in Corby’s accent which is called Corbyite and has a Glaswegian twang. This link with Scotland remains to today. In the 2001 Census almost 19% of the population were Scottish born with a further 33% with Scottish ancestry. This heritage is kept well and truly alive with social and sporting clubs, supporters of the two Glaswegian football teams Celtic and Rangers (currently in administration). Corby is actually home to the largest Rangers Supporters Club outside of Glasgow and Northern Ireland. As well as being able to buy Scottish foods in the town, they also host a Highland Gathering every year mirroring the games in Scotland and featuring traditional Scottish music and dancing. Corby also has two Church of Scotland churches and is the only town in England apart from London to have this. ... that the song Steeltown by Scottish 1980’s band, Big Country was about all the migrant Scottish workers who came to Corby but then found themselves unemployed when the steelworks closed down. It was the steelworks that brought the Scottish contingent to Corby; when Scottish company Stewarts & Lloyds set up in the 1930’s so the influx started. The steelworks grew up in the area because Corby and the surrounding area had been mined for iron-ore since Roman times; by the 19th century with the railways providing the logistics to transport it and the discovery of more ironstone beds, the industry flourished. The ironstone works – producing one of the core ingredients of steel – joined up with Stewart & Lloyds in the 1930’s causing the first influx of workers. As Stewart & Lloyds was a Scottish firm and as much of Clydeside’s industry had closed, it is not surprising that many of the workers came from Scotland. Craftily by burning latex which produced dense black, low-lying clouds to cover the steel works, Corby’s plant was protected from bombing raids by the Germans. Corby only suffered a couple of small attacks – mainly unexplained bullet holes which can still be seen in some buildings. Meanwhile Corby steelworks manufactured the steel pipe line which was fed under the sea to reach the continent and supply Allied troops with fuel. You don’t need to hide under any clouds if you’re in need of a stairlift – in fact we’d love you to come out in the open about it. 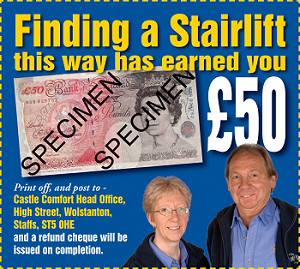 If you are considering buying one, please take a look at our stairlift prices. Remember we also offer reconditioned ones too at a reduced price. If you need some help with the prices there are grants available and also 0% finance to ease the strain – just like the stairlift does! And if you need any further advice just contact our local office on 01604 269919. Rockingham Castle was first built by William the Conqueror as a wooden construction. It was named after the nearby village. Subsequent kings built it in stone and added the gatehouse towers. The last monarch to stay in the castle was Edward III in the 14th century. Having fallen into disrepair it was sold to Sir Edward Watson by Henry VIII. Parts of the castle were replaced with a Tudor mansion and gardens whilst the remainder remained as a hunting lodge for visiting royalty. The woodland that surrounded the castle became known as Rockingham Forest. Parts of this remain today although it is described as a ‘patchwork’ because only small patches are still intact. The forest was designated as a Royal Hunting Ground favoured by Elizabeth I. Today Rockingham Forest is home to a growing population of Red Kites; these birds of prey were reintroduced in the area in 2000. · TV and film actor Brendan Coyle was born in Corby. He has been in a number of TV series including Silent Witness, the Lynley Mysteries and The Glass Virgin. If you want to join them, just contact us for any information you need or watch our founder Keith’s video at the top of this blog for some background information about stairlifts. Remember we can supply, install and offer you the best after-care service. Get in contact now for an assessment – we’ll have you up and running in no time. Call us on 01604 269919 .